Scope Modular sequencer modules have 32 sequences ("Pattern") which can be selected manually or by using one or more of these two modules below. up to 32 sequences can be remote-controlled from a midi keyboard. Out> [PNo] of sequencer module. 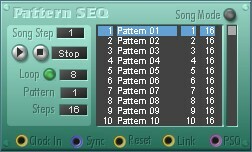 The PatternSequencer is a sequencer of its own; it has no reset input and has to be started manually (meaning that it cannot be integrated in a midi sequencer setup).The [Sync] input has to be connected with the Sync out of a gate seq or, preferably, a MDS8 module, [Reset] to Reset inputs of connected seq modules, [Link] to Clock inputs of connected modules, [PSQ] to PSQ inputs of connected modules.